The VMR-HD4D30-8 includes a robust selection of monitoring features, including event alarms, outlet-specific metering and SNMP polling to help you keep tabs on vital network elements, avoid costly service calls and maximize up time. The VMR-HD4D30 features four 30 Amp inputs, (8) eight individually metered and switched IEC C19 outlets and (8) eight 20 Amp UL-489 circuit breakers. Each circuit breaker protects one IEC C19 outlet and supports up to 20 Amps. The VMR-HD4D30-8 is ideal for remote power control and management of Cisco Nexus 9000 Series Switches, Juniper QFX10000 Series Switches and other high-amp equipment. Advanced outlet level power metering capabilities allow the VMR-HD4D30-8 to measure and report Kilowatt Hours, Kilowatts, Amps, Voltage and Temperature. When any of these factors exceed threshold values, the VMR-HD can switch or reboot power and promptly send notification. 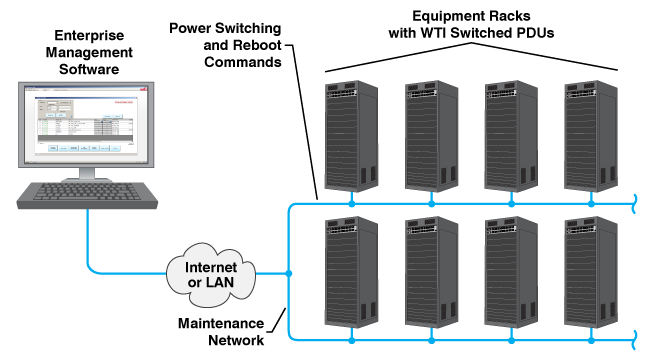 In addition to its many alarm functions, the VMR-HD can also perform remote reboots and power shutdowns on individual outlets according to a user-defined schedule, when a ping command fails or on demand. In this example, the VMR-HD4D30-8 is used to remotely reboot or power down a Cisco Nexus 9508 Switch. 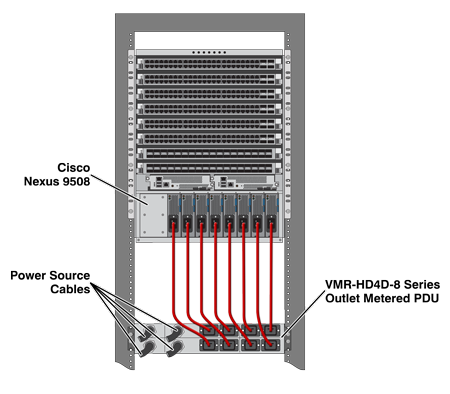 The VMR-HD4D30-8's eight switched, 20 Amp IEC C-19 outlets are used to provide power control for the Cisco Nexus. In addition to controlling power, the VMR-HD4D30-8 can also measure power consumption by the Nexus switch, and report results in chart or text format. In this example, the VMR-HD4D30-8 is used to remotely reboot or power down a Cisco Nexus 9516 Switch. 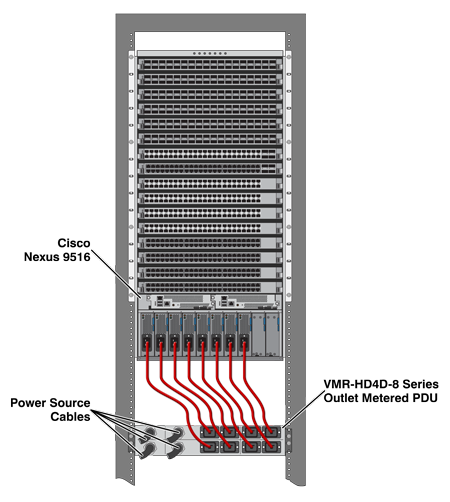 The VMR's eight metered and switched, 20 Amp IEC C-19 outlets are used to provide power control for the Cisco Switch. In addition to controlling power, the VMR can also measure power consumption by the Cisco switch, and report results in chart or text format. The VMR-HD4D30-8 can also provide remote power switching, reboot and current monitoring capabilities for Juniper QFX10000 Series Switches. In this example, two seperate VMR-HD4D30-8 units are used to provide primary and secondary power to a Juniper QFX10016 Switch in a power redundancy application. The VMR's eight switched, metered, 20 Amp IEC C-19 outlets are ideal for Juniper QFX10016 Switches that include up to eight power supply modules. The VMR's power metering capabilities allow administrators to keep track of current consumption at each outlet and report power data in convenient chart form or text format. The VMR's power consumption alarm feature can also notify support personnel when power consumption exceeds user-defined trigger values.